I wrote a previous article on long distance property managementabout this a while back. I also wrote about the disadvantages of having to manage out of state rental property. The secret to managing any property is to have great tenants. Great tenants can think ahead, and can anticipate issues before they occur. They take action to avoid having a problem. Regardless of where you live in relation to your properties, you need to be able to manage them effectively. Whether they are 7 miles away, or 700 miles away, you need to set yourself up so that you do not have to be on-site as often. My recent trip to Florida will illustrate an example that can help. My situation will not help you do a rental turn, but it will help you understand that you do not have to have boots on the ground at all times. I had my Florida trip booked a few months in advance, scheduled for the coldest month of the year, so I was ready for a nice warm up. It is a great place to strategize for the upcoming year and look at other properties. Fort Myers Beach was calling my name on Sunday, 1/25 and it was -12 degrees outside in Minnesota. My friend drove me to the airport, and was going to watch my dog for me. I loaded up the suitcase and dog in his vehicle and I headed to the airport. Tip: When you use a taxi cab to go out of town, the cab driver knows you will be gone. Is he/she also casing the place for a future break in? I have an Android smart phone with lots of contacts in it. They are also available on the web via Gmail contacts. Contacts are crucial elements when you need to get a problem resolved in your rental property. With 24 renters, soon to be 25, there will likely be some sort of tenant correspondence. Maybe it will be an emergency, maybe a quick answer, maybe a fix I need to schedule when I get back. I am not sure what people did before the internet, even though I was there. You should also have all maintenance items complete before you leave. If you leave one thing that “can wait”, it will come back to haunt you when you can least afford to deal with it. Upon getting to the Airport, and passing through the TSA, I was waiting at my gate. A tenant texted me and told me the CO detector was going off. I had this problem in the past with this unit, and after I cleaned the burners the CO issue was resolved. Now it was happening again. And I was on vacation. I told them to turn off the furnace, which they had already done. I offered space heaters, I told them to buy what they needed at Home Depot, and I would reimburse them. I called a plumbing and heating company to come over and give me an estimate. I had already received an estimate for this furnace from a different company a couple of months prior, so I knew the ballpark estimate. I have also changed out a few furnaces myself, and I know the cost of a replacement furnace. I am not going to pay neuro-surgeon rates to a furnace installer, no matter how good they are. I contacted the tenants again and let them know the furnace estimate guy would be there the next day. They were going to be home, so it was not a big deal. The estimate came back at $3,550.00. The estimate I had from the other company was only $1,875.00. The furnace itself is probably less than $750.00. So it makes sense to get a couple of estimates and know what a basic install should be at. I saved $1,675.00. That was the only call I received from my tenants that I remember. When you are away from your own property you should do a few things that I do. Turn off your water main. If you have a massive freeze, it may help prevent damage. Turn your water heater to vacation mode. It will save money. I have two Nest thermostats, so I can check on the temperature from anywhere in the world. I set the away temperature to 50. I have hot water heat, with radiators, so it always takes a long time to heat back up from a lower temperature. The last morning we were in Florida, I logged in to the thermostats and set the temperature to 70. When we got home, it was nice ad warm. Great invention, great product. I also have security cameras that I can log into to see what happens when I am gone, and all events are recorded. As a matter of fact, a motion detector went off in my own home, and the police were called out. Nothing was found. I also went back and reviewed the security footage, and there was not issue. When it’s -12 and 3 AM, criminals are in bed. I did look at a 4-plex. $825K, near the beach, with $125K a year in revenue. It was tempting… Not so much for the numbers, but the warm weather and location is appealing. Other properties were over $1M. Ouch! We did a few things in Florida, and ate a lot. Never the same place twice. I ate grouper about 10 times, so if the market price of Grouper spiked that week I was there, you know why. We took the Audubon Societies Crooked Creek Boardwalk trail. It is a 2.25-mile boardwalk trail through the swap. There were a few birds, and a bunch of birders. Some had cameras with lenses that could take a picture of Neil Armstrong on the moon. They got all excited about a yellow-bellied sap sucker bird. To me, it just looked like a standard woodpecker. When I was a kid, I probably shot many with my trusty BB gun, but I didn’t want to tell them that. An alligator was sitting on a bump in the marsh. I thought someone should throw a stick at it to get it to move a bit, but I refrained from doing it. A cottonmouth moccasin was soaking up the sun just a few feet away from the boardwalk. Plenty close enough if I had a shovel. It was all I could do to keep from getting a stick and killing it. No good comes from poisonous snakes. They are better off plenty afraid of humans anyway. I only had my tennis shoes on and the ground was swampy, and there weren’t any handy sticks around, so it got to live another day. If I ever move to Florida, I will have to kill an extra one to make up for the one I let get away. Those birders would have probably come around the bend and saw me and freaked out. A good adventure, and something to do in Florida if you are in the area. We went to the Ford and Thomas Edison’s Winter Estates. That is a great place, Edison has invented anything there is to invent. I am not sure how he did it, as all the places he lived in were prior to 1978, and lead paint was all over. No calculators, no computers. But he figured out a lot of things. The advantage of having such cold weather when we were there is we saw a bunch of manatees. They are an odd creature, sort of like a Walrus without tusks. At Manatee Park, there were plenty of them. The park service counted at least 137+ on one day we were there, and 125+ another day. There are only a couple of months of the year that they congregate there. It was on the way to a couple of places we went, so it was a quick and an almost free stop. Only $2 per hour to park, and admission is free. 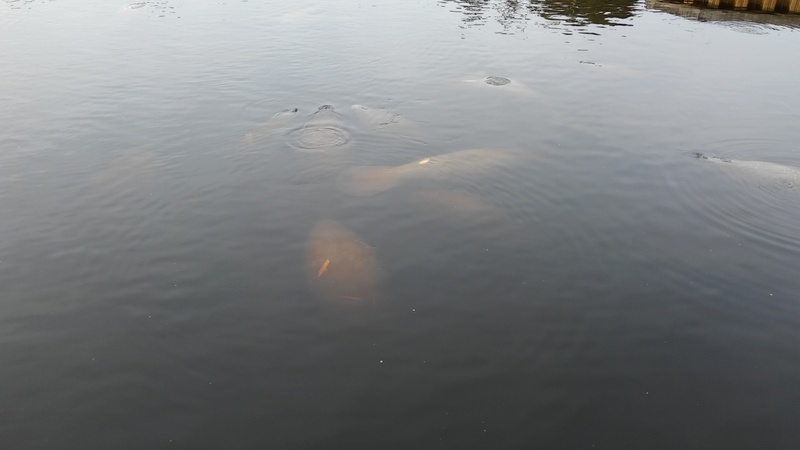 Here is a short video I took of the manatees.